What Drove Up US Household Debt? Over the last three decades, the stock of US household debt has ballooned. This can be explained by a number of developments—rising real estate prices, increasing inequality, stagnating real wages, the financial liberalization of the economy that relaxed financial constraints for a large portion of households, financial innovations in the credit market, underlying social forces, and demographic shifts. This unprecedented increase in US households’ debt stock has raised concerns among economists and policy makers about the level and sustainability of over-indebtedness. As shown already by the 2007 financial crisis, high levels of household debt can pose a threat to the stability of the entire financial system. But as we are discovering after the crisis, they can also create a major ongoing drag on economic growth suppressing both consumption and investment. It, is therefore, crucial to scrutinize the factors that drove the US household debt to unsustainable levels with the goal of gaining a better understanding of how to avoid unsustainable levels of debt in the view. Figure 1 shows the ratios of mortgage and consumer debt relative to disposable personal income (DPI). Clearly, mortgage debt accounts for the lion share of household debt in the US: in 2014, it accounted for around 68% of total household debt, while in 2008 it peaked at 75% of total household debt. Mortgage debt rose more than threefold during the second half of the 20th century indicating an average growth rate of about 3% per year. It increased at a rapid and steady pace from the late 1940s to the mid-1960s, stabilized for two decades, and then exploded from the late 1980s to the bursting of the housing bubble in 2007. Since the crisis, it has fallen somewhat as housing prices collapsed and households have begun to deleverage. 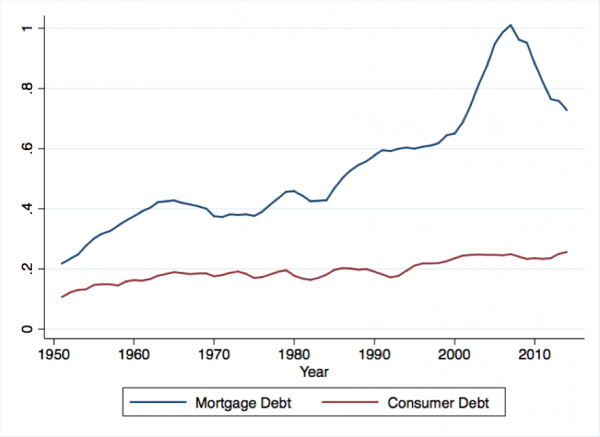 Consumer debt grew much more modestly than mortgage debt since the 1950s. As shown in Figure 1, consumer credit outstanding relative to disposable personal income reached 25% in 2006, declined slightly for a few years after the crisis, before reaching a new high in 2015. Consumer debt experienced a few in the second half of the 1980s until the Dot-com bubble, in part because of changes in the tax code that removed deductions on interest paid for consumer loans. Otherwise, consumer debt has risen at a slow and steady pace (Barba and Pivetti, 2009). The rise in aggregate household debt since the 1980s coincided with a fall in personal saving rates, which reached very low levels before the 2007 crisis (Figure 2), and simultaneous a rise in aggregate consumption (Figure 3). The simultaneous movement of these variables suggests possible linkages among debt, savings, and consumption. This article reviews the some of the main approaches to the evolution of household debt found in the economics literature. We begin by investigating work related to the cornerstone, orthodox theory of household debt, the Life-Cycle Hypothesis, and we point out its shortcomings. We proceed by exploring alternative explanations for excessive increases in household indebtedness and we draw particular attention to such factors as demographic change, asset price rises, inequality, financial innovation, peer behavior, and financial liberalization. The cornerstone of the neoclassical theory of household finances is the Life-Cycle Hypothesis (LCH), a theoretical attempt to explain consumption and saving behavior across a household’s lifespan (Modigliani and Brumberg, 1954; Ando, Albert; Modigliani, 1963). The benchmark life-cycle model is based on a set of postulates about household behavior. According to the LCH, consumers are far-sighted, make thoughtful choices about their future income levels, have unlimited access to credit, have no bequest motives, and have no room for strategic default. The main insight of the model is that households smooth consumption levels during their lifespan. In other words, their saving and spending behavior adjusts so that their consumption does not fluctuate across the stage of their life. Young and older households are typically less productive than those in the middle section of the age distribution, and therefore have low incomes relative to their consumption. The middle-aged, on the other hand, generate greater earnings that exceed their consumption needs. The LCH implies that the young and middle-aged would save so that, by the age of retirement, they will have accumulated a sufficient amount of assets to smooth their consumption as their income drops. Once they retire, they run down their accumulated assets to support themselves. The need to accumulate assets for retirement serves as the main incentive to save in the life-cycle model. How do borrowing and household debt fit into the life-cycle hypothesis' narrative? Tobin (1967) went as far as to suggest that in the early stages of the life-cycle, a household, expecting its income to grow, might even borrow up to levels that would make its current net worth negative in order to afford the costs of housing and establishing a family. Figure 4 graphically represents Modigliani’s original hypothesis and Tobin’s variant. 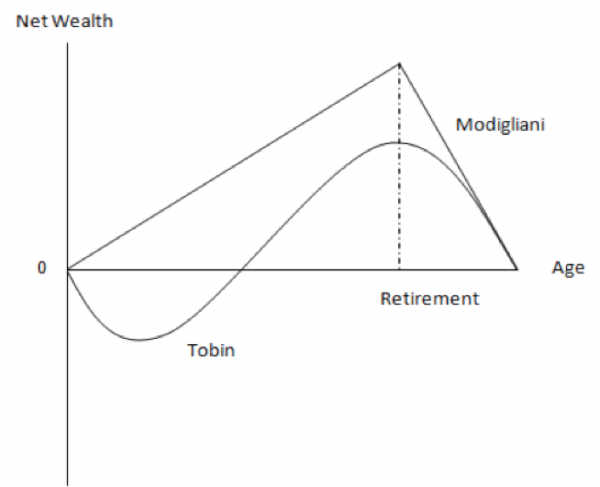 According to Tobin’s variant of the life-cycle model, it is optimal for younger individuals to borrow and attain a higher level of consumption than one allowed by their income. The idea is that younger households would expect their productivity and earnings to increase in the future. As the household ages, its income exceeds its consumption requirements, resulting in an increasingly positive net worth. The increased income that comes with middle age will allow the household to pay off its early life’s debts and accumulate savings for retirement as it would in the standard version of the model. Modigliani did accept the possibility of a household choosing to have negative net worth in the expectation of rising income, though only on a theoretical basis. He was doubtful that younger individuals would be given enough resources to attain a standard of living way beyond what they could sustain by their own means (Deaton, 2005). While the life cycle hypothesis provides many insights, it also has a significant number of problems. The benchmark model is founded on the following assumptions: the household has unlimited ability to borrow; there is no risk of default associated with holding debt; the cost of borrowing does not vary, and households have perfect foresight about their future non-fluctuating earnings. These assumptions are far from reality. In practice, households can hardly predict their future income path; future income is uncertain and vulnerable to various shocks such as unemployment. Additionally, households, especially young ones, face credit constraints that prevent them from borrowing against their future income, let alone smoothing consumption throughout their entire lifespan. A number of authors have addressed these criticisms by introducing uncertainty and credit constraints into the life cycle models (see Hall, 1979; Zeldes, 1989). It has also been suggested that the model is more appropriate for explaining the financial behavior of the upper middle classes as opposed to that of the working classes or the capitalists (Wolff, 1981). The insights provided by the life-cycle hypothesis for the total debt accumulation in the economy are dependent on the structure of the population, in other words, the relative shares of the various age groups in a country. Younger individuals are assumed to borrow more while older ones to pay off their debts. Following this reasoning, increases in the youth share of the population should be associated with increases in the overall level of household debt, while increases in the share of the elderly would imply lower levels of household debt as the retired are assumed to downsize their assets to counterbalance the income losses due to lower productivity (Dynan and Kohn, 2007; Barnes and Young, 2003). The literature identifies two distinct periods of demographic shifts in the recent history of western economies: first, the “baby boom” period, during which a tremendous rise in fertility rates took place in most of the western world after WWII; and second, the “aging of the population” period, which we are currently experiencing, characterized by large increases in the length of life and falling fertility rates (Elmendorf and Sheiner, 2000). Although the US fares better than most European countries, it remains an aging nation. According to one estimate, the number of elderly individuals is projected to increase by 135% during the first 50 years of the 21st century. (Wiener and Tilly, 2002). But the life-cycle model’s predictions that debt should decrease with the aging of the population have not been borne out by US demographics. In fact, household debt has increased along with the aging of the population. According to the 2010 U.S. Census, the median age in the US raised from 35.3 in 2000 to 37.2 in 2010. At the same period, the household debt to GDP ratio rose by almost 30%. Thus, the composition of debt by age group does not conform to the life-cycle model. 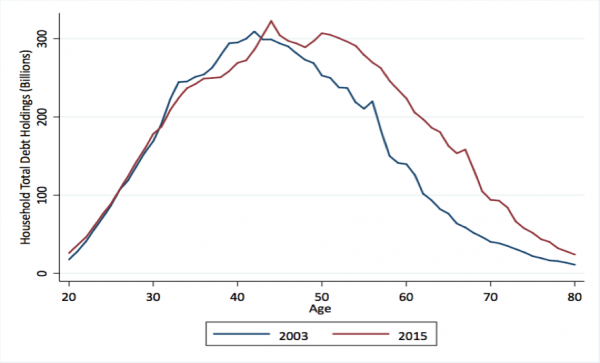 As the elderly population of the US increases, one would expect lower holdings of debt overall and higher shares of household debt by younger borrowers with lower earnings. Nevertheless, recent evidence by Brown et al. (2016), who used the Fed’s consumer credit panel/Equifax, suggests that the bulk of US debt balances has shifted towards older households. This is presented in figure 5, which shows the total debt holdings distributed by age in 2003 and in 2015. The same study found that, with the exception of student debt, younger households held lower levels of all types of debt (e.g. mortgages, credit cards, auto loans) and that older households held considerably more debt when compared to their similar age counterparts back in 2003. How can these counter-intuitive patterns in household debt structure be explained? The authors suggest that high debt levels witnessed at the decade prior to the Great Recession were encouraged and incentivized by the loosening of lending standards during the credit boom. The subsequent tightening of the credit supply prevented further borrowing. Therefore, the deceleration in lending would shift the bulk of debt balances towards older age brackets as younger households no longer have the opportunity to borrow at similar levels as the preceding generation did (Brown et al., 2016). One could also argue, however, that increased longevity motivates households to hold debt for longer periods or make banks more willing to lend to individuals later in their lives since their retirement age has increased as well (Kent et al., 2007). Indeed, credit scores tend to rise with age; the older one gets the less risky borrower an individual is perceived to be (Brown et al., 2016). Escalating student debt in the US also challenges the postulates of the life cycle hypothesis. According to the LCH, it would be rational for younger individuals to take on student loans to invest in tertiary education, hoping that their skills will lead to higher income and wealth in later stages of their lifespan. High debt levels for the younger age cohort should, therefore, be considered perfectly normal, as this group of borrowers now foresee higher future income level later in life. Indeed, as more high-school graduates pursue tertiary education over the past few decades, student borrowing has increased considerably; from 2000 and 2014, its total volume nearly quadrupled to over $1.1 trillion (Burke, 2015). Nevertheless, increasing evidence suggests that excess student loan accumulation effectively worsens the financial health of individuals by driving them to carry a higher debt burden later in life (Elliot and Nam, 2013). Although richer households typically carry higher student loan debt, poorer households carry the greatest student loan debt as a share of their income. Considering the mediocre employment prospects for educated Americans, the debt burden accumulated due to student loans might take much more time to deleverage than the life cycle model predicts. As larger portions of graduates fail to service their debt and interest or principal repayments, write-offs might be necessary. Such cases of over-indebtedness are at odds with the life-cycle model. The model looks at household debt behavior from an intertemporal utility maximization perspective with agents seeking to smooth their consumption levels across their life-course. It leaves no room for over-indebtedness. All debts are assumed to be repaid by the households in their old age. These divergences between theory and reality led some scholars to question the assumptions of rational borrowing behavior or to complement them with other features. In the remainder of this paper, we discuss alternative approaches that have addressed household indebtedness, considering diverse factors such as the broader macroeconomic environment, financial liberalization, technological advancements, as well as rising income inequality. The stable macroeconomic environment of the late 20th century is partly responsible for the rise in household indebtedness. “The Great Moderation,”—i.e., the 25 years preceding the financial crisis of 2007—were characterized by a combination of low inflation, low interest rates, and rising real estate prices on a world scale. Each of these macroeconomic developments contributed to the rise of household debt in its own right. Moderate inflation rates, accompanied by low nominal interest rates, pushed front-end payments by mortgage borrowers downward, hence making credit payments more attractive (Debelle, 2004). This spurred households to take on more debt. At the same time, moderate inflation translates to lower growth of nominal household income. As the nominal value of a loan contract erodes, the overall household debt-to-income ratio and the debt service-to-income ratio increase (Debelle, 2004). Thus, households are left with higher debt-to-income ratios. As Atif Mian and Amir Sufi have pointed out, increases in real estate prices are associated with more household borrowing through various channels (2011). The movement of housing prices in the US is depicted in figure 6. The boom in real estate prices starting in the late 1990s goes hand in hand with the rises in household debt, shown in figures 1 and 2. Increasing housing prices lead households to feel wealthier and thus to apply for larger loans. Additionally, banks are more eager to provide funding backed by appreciating collateral, which, in turn, pushes the demand for housing assets up, leading prices even higher. Rising home values also lead households to engage in more “mortgage equity withdrawal”, i.e., extracting equity from the value of their households to buy housing services, smooth consumption, or invest in bonds, stocks or tax-deferred retirement assets. What is often pictured in advertisements as “installing an ATM on the side of your house” is well validated by empirical studies; mortgage equity withdrawal levels closely track household consumption, especially for low and middle-income households (Klyuev and Mills, 2006; Lydon 2012). When housing prices rise, households are more likely to extract equity from their property as they are less concerned about potential negative equity and they are more confident of rising future income (Debelle, 2004). Additionally, there is considerable motivation for households with mortgages to borrow to exploit interest rate differentials. As we saw during the housing boom, credit-constrained borrowers with limited collateral capacities take advantage of increases in the value of their property to receive more credit and move towards a higher level of borrowing and consumption. Indeed, there is considerable evidence that that increases in inequality go hand in hand with greater household indebtedness. Figure 7, shows the correlation of the two variables since the 1970s in the US economy. Figure 7. Household Debt to DPI and Inverted Pareto Coefficient for the US Economy from 1970 to 2014. A number of influential works rooted in sociology identified the role that social forces play in determining debt behavior in relation to consumption (Veblen, 1989; Duesenberry, 1949). According to these scholars, household consumption preferences in an industrialized society are largely determined by social norms created by reference to the consumption patterns of a similar or higher social class. Indeed, it is the level of consumption that determines whether an individual is acceptable as a member of a given class or community. Contrary to savings, consumption has the advantage of being “socially visible.” In other words, the purchase of a luxurious car or expensive watch is more tangible and visible ways to demonstrate one’s social standing than bank deposits are. Therefore, the individual has a clear motive to use borrowed funds for consumption purposes in order to be perceived as being higher in the social hierarchy. Provided that credit is given with ease, a number of consumers are likely to exploit credit cards and other means of borrowing to reach the level of their peers or the next upper class (Scott, 2007). These ideas were formalized by Robert Frank in an analytical framework termed the “Expenditure Cascades Hypothesis” (Frank, 1985; Frank et al., 2010). In other words, they argue “a process whereby increased expenditure by some people leads others just below them on the income scale to spend more as well, in turn leading others just below the second group to spend more, and so on” (Frank et al., 2010). Similarly, as Barry Cynamon noted, a household’s consumption preferences are not determined merely by the historical consumption path, but rather, they are better seen as as endogenous in the system, determined by peer effects, the media and the broader social context (Cynamon 2008). From a supply-side perspective, higher inequality leads to a higher supply of credit, as the top income groups reinvest in loanable funds markets. Kumhof et al. (2015) link household debt, inequality, and the risk of experiencing a financial crisis. According to the authors, increasing inequality leads wealthier households with a higher marginal propensity to save to employ a greater part of their earnings to provide loans for lower income groups. As lower income groups borrow more, their debt-to-income ratios increase, and this,in turn, increases the overall fragility of the financial system. In a similar vein, Iacoviello (2008) argues that debt levels in less wealthy households have increased along with inequality since the 1980s because as inequality increases, more credit is available to flow from the rich to the poor. 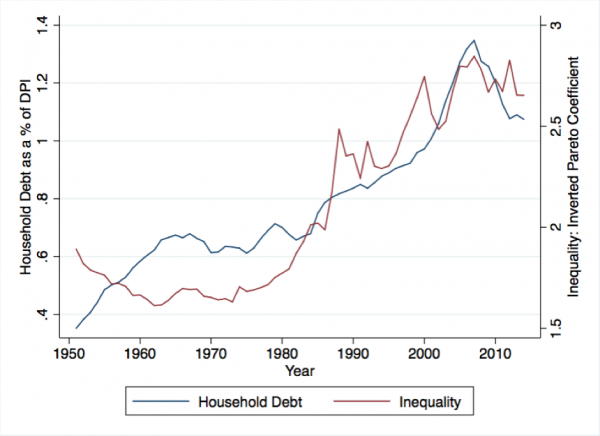 In an environment of rising inequality, household over-indebtedness can also be interpreted as a product of the boom-bust cycle from as described by Hyman Minsky (Cynamon and Fazzari, 2008; Kim, 2013). At the beginning of the business cycle, financial innovation and relaxed credit constraints allow households with decreasing real wages to maintain their consumption at the level of their peers by means of borrowing. Increasing collateral prices reinforce this process, leading households to borrow more in ways that result in potentially vulnerable financial positions. Consumption spending fueled by household debt contributes to the maintenance of aggregate demand at high levels. When the expansion reaches its peak, household financial fragility measured by debt-to-income ratios increases, credit constraints tighten and asset prices fall. Debt-driven consumption ceases to be the engine of growth, the financial system destabilizes and the recession deepens. The position of indebted households becomes particularly fragile as they are vulnerable to unexpected shocks, such as drops in income and unemployment, while their collateral values decline, leaving them “underwater” with insufficient income sources to service their debt. Other research relating debt and inequality suggests that consumers borrow to smooth consumption during periods of idiosyncratic income shocks. This line of reasoning argues that debt figures would be expected to grow when the economy experiences a recession, since individuals who lose their income through unemployment, or slower wage growth, would borrow more to smooth their consumption. This theory, however, is not borne out by the experience of the last 20 in developed countries. Instead of borrowing more during the recession, households have actually deleveraged modestly (Christen and Morgan, 2005). This asymmetric relationship between income growth and household debt needs further investigation. Another possible factor explaining the buildup of housing debt relates to changes in the financial system that allowed for easier access to credit especially on the part of credit constrained households. Credit constrained households are those that are denied credit or are not able to get as much credit as they applied for. It is common for financial intermediaries to restrict credit to certain households due to asymmetric information (moral hazard and adverse selection) in the credit market. In other words, it is not always possible for lenders to estimate the capacity and willingness of borrowers to service their debts. This uncertainty makes them reluctant to lend funds, as they are concerned that they may attract risky borrowers or strategic defaulters. To select who is qualified for a loan as well as the level of that loan, they apply models and rules of thumb that help them filter out high-risk borrowers, e.g., quantity rationing. While the extent to which credit constraints are binding varies over time, across countries, and across financial institutions, their presence imposes a considerable effect on the composition and magnitude of debt holdings in households balance sheets (Kent et al., 2007). The US, as most developed economies since the 1980s, experienced excessive deregulation of the financial industry. This process involved, inter alia, the relaxation of credit restrictions for given lending standards, leading to increases in the credit supply. For instance, Cox and Jappelli (1993) estimate the gap between desired debt and the debt actually reported in surveys and the effects of credit restrictions on this gap. Their findings suggest that removing credit constraints increases overall household debt holdings by nine percent. The expansion of credit to middle and lower income households is also known as the “democratization of credit,” a term originally employed by former Federal Reserve Governor Lawrence Lindsey in 1997. In conjunction with deregulation, the US financial industry experienced an increasing degree of technological sophistication. The level of innovation that has taken place during the last 30 years concerned the consumer as much as the investor. Advancements in the technology of loan production, administration, and allocation, have allowed households to exploit financial markets and borrow more (Dynan and Kohn, 2007; Dynan, 2009). At the same time, notable improvements in risk management systems helped banks to increase the supply of credit, without having to worry too much about the resilience of the financial system. Greater monitoring capacity of borrowers and improved tools to assess the rate of their credit-worthiness, opened the space for banks to compete more forcefully in credit markets and to lower lending standards. For instance, the introduction of risk-based pricing— i.e. the tailoring of the loan’s price to a borrower’s probability of default—is linked to a large portion of the increase in US debt levels (Edelberg, 2006). Moreover, evidence suggests that innovation in the mortgage market enhanced the ability of young households to purchase real estate tailored to their expected growth in income (Gerardi, et al., 2007). In addition to advancements of financial technology, a good deal of innovation occurred in the domain of the “technology of persuasion” (Zinman, 2015). Advancements in marketing techniques for financial products have been reported as significant contributors to household debt rises (Bertrand et al., 2009). On the negative side, practices such as mortgage steering and predatory lending often allowed low-income households to borrow above the levels they could actually afford to repay or to accept mortgage products of inferior quality compared to those that they should have originally been qualified for (Stango and Zinman, 2011; Agarwal and Evanoff, 2013). Is there room for more financial innovations that could encourage a new wave of lax lending and, therefore, the buildup of financially unstable positions? In the context of the housing bubble, the housing market collapse in the US led to a considerable tightening of credit and increased banking regulation that seemingly prevents the buildup of a new financial bubble in the housing sector. Nevertheless, complying with regulation may increase transaction costs for both consumers and suppliers of financial services. Increased regulation, in turn, incentivizes further financial innovation to minimize the cost imposed on financial transactions. This can be either beneficial to the society, say by increasing competition and driving prices lower, or detrimental, by allowing the banking sector to avoid regulation. Indeed, Perez (2010: 186) warns us that the “the space of the technologically possible is much greater than that of the economically profitable and socially acceptable. It is with profit in mind that entrepreneurs and managers are constantly turning inventions into innovations; technical possibilities and discoveries into economic realities.” Therefore, the challenge for policy makers is to construct an institutional setting capable of turning financial innovation towards a socially beneficial direction, which is not always an easy task. The US economy’s over-reliance on debt was exposed in the financial crisis of 2007. Since then, household debt to disposable income ratio has fallen by 26% as a result of mortgage defaults, a tightening of credit supply, and household deleveraging (McKinsey, 2015). The drop in demand along with the eruption of the crisis prolonged the recession and increased its severity. While rising housing prices triggered more borrowing and demand, the drop in US housing prices after the crisis triggered a vicious cycle that trapped the economy in an extended period of deflation. The US has thus seemingly moved away from the risk of a new debt-led boom and bust cycle. At the same time, rebounding asset prices and loosening credit conditions amid a prolonged period of zero-bound monetary policy warrant concern that the stage is being set for another potential financial bubble. It is appropriate for both policy-makers and academics to devote more attention to the question of household debt, what drives it, and how we can prevent excessive credit creation and future financial crises. On the policy side, policy-makers can take a number of measures to make the system less prone to financial crisis. For one thing, they can develop better tools for monitoring the sustainability of household debt to prevent it from climbing up to excessive levels again. Second, they can improve the technology of loan contracts and mortgages. They could, for example, encourage the use of loan contracts that adjust to fluctuations in income levels or housing prices. This would discourage defaults (strategic or not), and would ensure a continuous flow of payments to the banking system (Shiller et al., 2011). Lastly, they should strengthen the macroprudential policy agenda of central banks to minimize the risk of over-indebtedness to the financial system. For example, countercyclical reserve requirements on the banking system might help to moderate debt increases when the credit expansion is overheating (McKinsey, 2015). Household debt is not necessarily a bad thing, but overreliance on it can feed boom and bust cycles and make households vulnerable to unexpected shocks. On the academic front, despite the importance of household debt and its contribution to the business cycle, it remains a poorly studied area in the macroeconomics and household finance literature. The apparent links between the financial crisis and the unprecedented levels of household indebtedness have renewed the interest in studying the liability side of household balance sheets. As we have argued here, no single factor drove US household debt up. Instead, a complex combination of economic, institutional, and social forces allowed households to accumulate vast debt stocks and reach financially fragile positions. These forces included: financial liberalization of the economy that relaxed financial constraints, rising real estate prices, increasing inequality and the stagnating real wages, as well as underlying social forces and demographic shifts. Our analysis suggests that we need to reduce our reliance on the on the postulates of the Life-Cycle Hypothesis. Despite its insights as an analytical tool for modeling inter-temporal consumption exercises in neoclassical economics, the Life- Cycle theory does a poor job in explaining the ballooning indebtedness of US households since the 1980s. Leaving demographic change aside, where this theory may still to offer some insights, we argue that alternative accounts of debt stock increases are more compelling. One promising area of research that needs to be expanded entails the relationship between inequality, indebtedness, asset prices and financial crises. The empirical evidence suggesting co-movement between inequality, debt stocks, and housing prices during the decades prior to the Great Recession confirms the need to further develop and test various hypotheses relating to this relationship. The nature of the links between indebtedness and inequality should be explored in more depth as many questions still remain. Is the relationship symmetric in the long run? Inequality may lead to increases in household debt but do reductions in household debt lead to lower inequality? More importantly, what is the direction of causation between the two variables? Further interdisciplinary work within the areas of behavioral economics and sociology might be able to shed more light on the relationship between these variables. Also, aggregate macroeconomic models do not always allow the modeler to address agent interaction and peer behavior appropriately. Simulations performed with Agent-Based Models, using interacting agents with adaptive and imitating behaviors are more likely to provide evidence of how complex interacting behavior at the micro level feeds into the macro level. Using agent-based simulations to account for interaction among agents is a promising field for future research, but very few studies have explored household finances using this approach. Finally, empirical research based on big data would be able to shed more light on the heterogeneity that characterizes household balance sheets, than studies limited to survey data with few observations. In sum, much further work is required both at the macro and micro levels, and between them. Agarwal, S. and Evanoff, D.D., 2013. Loan product steering in mortgage market. Available at SSRN 2204400. Akerlof, G.A. and Kranton, R.E., 2000. Economics and identity. Quarterly journal of Economics, pp.715-753. Ando, A. and Modigliani, F., 1963. The" life cycle" hypothesis of saving: Aggregate implications and tests. The American economic review, 53(1), pp.55-84. Barba, A. and Pivetti, M., 2009. 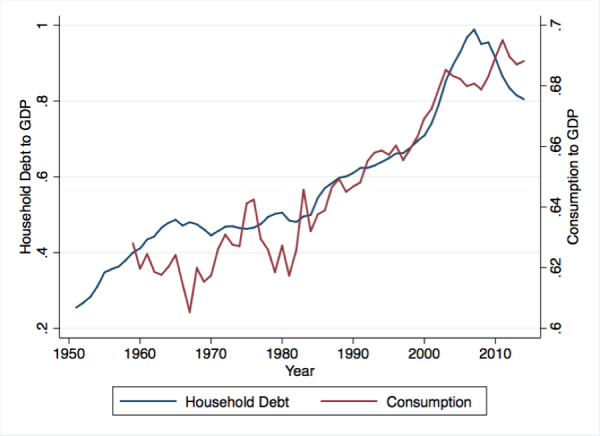 Rising household debt: Its causes and macroeconomic implications—a long-period analysis. Cambridge Journal of Economics, 33(1), pp.113-137. Barnes, S. and Young, G., 2003. 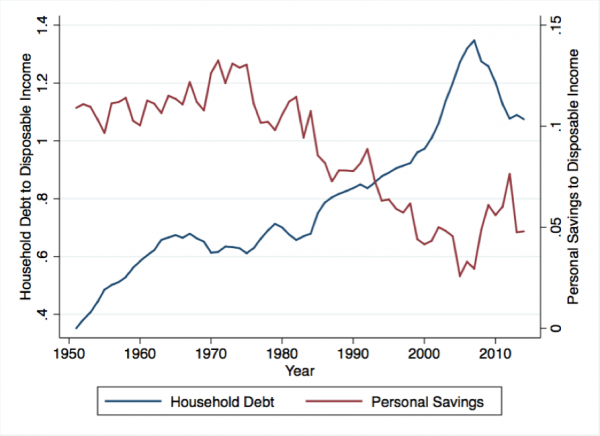 The rise in US household debt: assessing its causes and sustainability. Bertrand, M., Karlan, D.S., Mullainathan, S., Shafir, E. and Zinman, J., 2009. What's advertising content worth? Evidence from a consumer credit marketing field experiment. Yale University Economic Growth Center Discussion Paper, (968). Brown, M., Lee, D., Scally, J. and Wilbert V., 2016. ‘The Graying of American Debt.’ Web log post. Liberty Street Economics. Federal Reserve Bank of New York. Web. 12 Apr. 2016. Retrieved from <http://libertystreeteconomics.newyorkfed.org/2016/02/the-graying-of-american-debt.html#.VxS-CRMrI0q>. Burke, A. 2015. 5 Facts about Student Debt in the U.S." Web log post. Brookings. N.p., Web. 12 Apr. 2016. Retrieved from <http://www.brookings.edu/blogs/brookings-now/posts/2015/10/5-facts-about-student-debt-in-the-us>. Cardaci, A. 2014. Inequality, household debt and financial instability: an agent-based perspective. Working paper. Carr, M.D. and Jayadev, A., 2015. Relative income and indebtedness: evidence from panel data. Review of Income and Wealth, 61(4), pp.759-772. Christen, M. and Morgan, R.M., 2005. Keeping up with the Joneses: Analyzing the effect of income inequality on consumer borrowing. Quantitative Marketing and Economics, 3(2), pp.145-173. Cox, D. and Jappelli, T., 1993. The effect of borrowing constraints on consumer liabilities. Journal of Money, Credit and Banking, 25(2), pp.197-213. Cynamon, B.Z. and Fazzari, S.M., 2008. Household debt in the consumer age: source of growth--risk of collapse. Capitalism and Society, 3(2). Deaton, A., 2005. Franco Modigliani and the life cycle theory of consumption. Available at SSRN 686475. Debelle, G., 2004. Macroeconomic implications of rising household debt. Dynan, K.E. and Kohn, D.L., 2007. 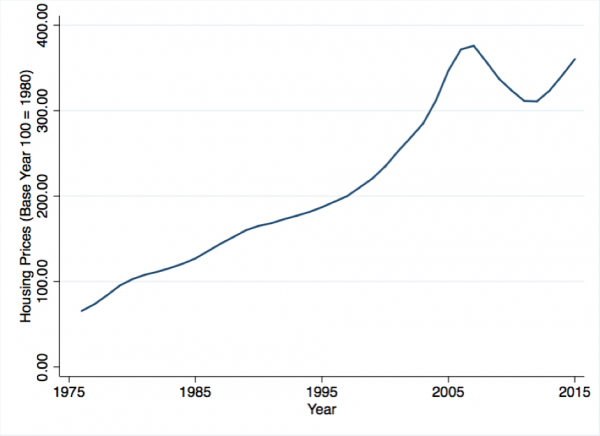 The rise in US household indebtedness: Causes and consequences. Dynan, K.E.. 2009. Changing Household Financial Opportunities and Economic Security. Journal of Economic Perspectives, 23(4), pp. 49-68. Duesenberry, J.S., 1949. Income, saving, and the theory of consumer behavior. Cambridge MA: Harvard University Press. Edelberg, W., 2006. Risk-based pricing of interest rates for consumer loans.Journal of Monetary Economics, 53(8), pp.2283-2298. Elmendorf, D.W. and Sheiner, L.M., 2000. Should America save for its old age? Fiscal policy, population aging, and national saving. The Journal of Economic Perspectives, 14(3), pp.57-74. Elliott, W. and Nam, I., 2013. Is student debt jeopardizing the short-term financial health of US households. Federal Reserve Bank of St. Louis Review, 95(5), pp.405-424. Frank, R.H., 1985. The demand for unobservable and other nonpositional goods. The American Economic Review, 75(1), pp.101-116. Friedman, M. and National Bureau of Economic Research, 1957. A theory of the consumption function (Vol. 63). Princeton: Princeton University Press. Georgarakos, D., Haliassos, M. and Pasini, G., 2014. Household debt and social interactions. Review of Financial Studies, 27(5), pp.1404-1433. Gerardi, K., Rosen, H.S. and Willen, P., 2007. Do households benefit from financial deregulation and innovation? the case of the mortgage market (No. w12967). National Bureau of Economic Research. Greenspan, A. and Kennedy, J., 2008. Sources and uses of equity extracted from homes. Oxford Review of Economic Policy, 24(1), pp.120-144. Hall, R.E., 1979. Stochastic implications of the life cycle-permanent income hypothesis: theory and evidence. NBER working paper, (R0015). Hurst, E. and Stafford, F., 2004. Home is where the equity is: Mortgage refinancing and household consumption. Journal of Money, Credit and Banking, pp.985-1014. Iacoviello, M., 2008. Household debt and income inequality, 1963–2003.Journal of Money, Credit and Banking, 40(5), pp.929-965. Kent, C., Ossolinski, C. and Willard, L., 2007. The Rise of Household Indebtedness, The Structure and Resilience of the Financial System, Proceedings of a Conference, Reserve Bank of Australia, Sydney. Klyuev, V. and Mills, P.S., 2006. Is Housing Wealth an 'ATM'? : The Relationship Between Household Wealth, Home Equity Withdrawal, and Saving Rates. König, N. and Größl, I., (2014) ‘Catching up with the Joneses and Borrowing Constraints: An Agent-based Analysis of Household Debt,’ Macroeconomics and Finance Series 4/2014, University of Hamburg, Hamburg. Kim, Y.K., 2013. Household debt, financialization, and macroeconomic performance in the United States, 1951-2009. Journal of Post Keynesian Economics, 35(4), pp.675-694. Kish, A., 2006. Perspectives on recent trends in consumer debt. Federal Reserve Bank of Philadelphia, Discussion Paper (June). Kumhof, M., Rancière, R. and Winant, P., 2015. Inequality, leverage, and crises. The American Economic Review, 105(3), pp.1217-1245. Frank, R.H., Levine, A.S. and Dijk, O., 2010. Expenditure cascades. Social science. Lydon, R. and O'Hanlon, N., 2012. Housing equity withdrawal, property bubbles and consumption. Lustig, H.N. and Van Nieuwerburgh, S.G., 2005. Housing collateral, consumption insurance, and risk premia: An empirical perspective. The Journal of Finance, 60(3), pp.1167-1219. McKinsey, G.I., 2015. Debt and (not much) Deleveraging. McKinsey Global Institute. Mian, A. and Sufi, A. 2009. The Consequences of Mortgage Credit Expansion: Evidence from the U.S. Mortgage Default Crisis. The Quarterly Journal of Economics, 124(4), pp.1449–1496. Mian, A. and Sufi, A. 2011. House Prices, Home Equity-Based Borrowing, and the US Household Leverage Crisis. American Economic Review. 101(5), pp.2132–56. Modigliani, F. and Brumberg, R. 1954. Utility analysis and the consumption function: an interpretation of cross-section data, in Kenneth K. Kurihara, ed., PostKeynesian Economics, New Brunswick, NJ. Rutgers University Press. pp 388–436. Ortalo-Magne, F. and Rady, S., 2006. Housing market dynamics: On the contribution of income shocks and credit constraints. The Review of Economic Studies, 73(2), pp.459-485. Perez, C., 2009. Technological revolutions and techno-economic paradigms. Cambridge Journal of Economics, 34(1), pp.185-202. Rajan, R. 2010. Fault Lines: How Hidden Fractures Still Threaten the World Economy, Princeton University Press. Santos, A.C., Costa, V. and Teles, N., 2014. The Political Economy of Consumption and Household Debt: An Interdisciplinary Contribution. RCCS Annual Review. A selection from the Portuguese journal Revista Crítica de Ciências Sociais, (6). Scott, R.H., 2007. Credit Card Use and Abuse: A Veblen ian Analysis.Journal of Economic Issues, 41(2), pp.567-574. Shiller, R.J., Wojakowski, R.M., Ebrahim, M.S. and Shackleton, M.B., 2011.Continuous workout mortgages (No. w17007). National Bureau of Economic Research. Stango, V. and Zinman, J., 2011. Fuzzy math, disclosure regulation, and market outcomes: Evidence from truth-in-lending reform. Review of Financial Studies, 24(2), pp.506-534. Tobin, J., 1967. Life cycle saving and balanced growth. Ten economic studies in the tradition of Irving Fisher. New York: Wiley, pp.231-256. Veblen, T., 1899. The theory of the leisure class: An economic study in the evolution of institutions. Wiener, J.M. and Tilly, J., 2002. Population ageing in the United States of America: implications for public programmes. International journal of epidemiology, 31(4), pp.776-781. Wolff, E.N., 1981. The Accumulation of Household Wealth over the Life- Cycle: A Microdata Analysis. Review of Income and Wealth, 27(1), pp.75-96. Zeldes, S.P., 1989. Optimal consumption with stochastic income: Deviations from certainty equivalence. The Quarterly Journal of Economics, pp.275-298. Zinman, J. 2015, Household Debt: Facts, Puzzles, Theories, and Policies. Annual Review of Economics. 7(1), pp.251–276. For a detailed review of the recent neoclassical approaches on household debt, see Zinman (2015). Also, Santos et al. (2014) performed a review of the political economy of consumption and household debt, applying an interdisciplinary approach. Similar to the LCH, the Permanent Income Hypothesis (Friedman, 1957) suggests that agents take decisions on consumption based on their permanent rather than their current income. As a result, a change in consumption is not likely to occur due to a transitory change in income, but rather due to a permanent income shock. The LCH carries further macroeconomic implications which are of no interest to the present review but are of utmost theoretical significance for problems such as the ageing population in modern economies, or the effects of a stock market boom on savings behavior. Among others, the theory suggests that the savings of the economy are linked to the GDP growth rather than to its magnitude, and that the wealth level is linked to retirement length. For these reasons, the life-cycle theory served as the basic theory of aggregate savings for a number of years. For a detailed discussion on the macroeconomic implications of the life-cycle hypothesis and the relevant literature see Deaton (2005). See, for example, Lustig and van Nieuwerburgh, 2005; Ortalo-Magné and Rady, 2006; Mian and Sufi, 2009. A number of empirical and theoretical works followed this line of reasoning (see for example, Christen and Morgan, 2005; Cynamon and Fazzari, 2008); Georgarakos et al., 2014; Carr and Jayadev, 2015). “Lagging Behind the Wealthy, Many Use Debt to Catch Up,” Wall Street Journal, May 17, 2005. For a rich discussion on credit constrained households, see Cox and Jappelli (1993); Kish (2006). See, for example, Cardaci, 2014; König and Größl, 2014.